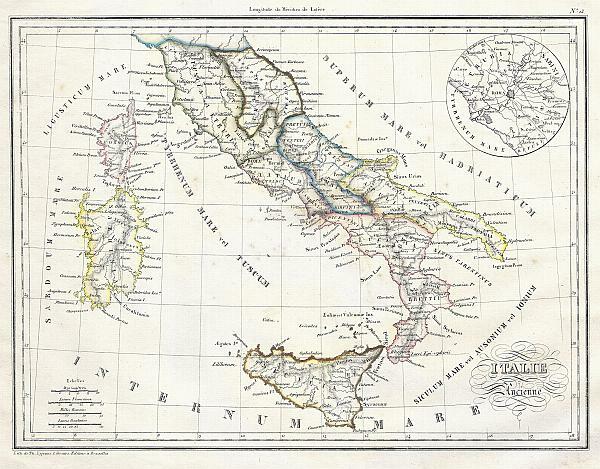 This is a beautiful 1837 hand colored lithograph map of Italy in Ancient Roman times. Includes an inset plan of the vicinity of Rome. All text is in French. Dated 1835. Malte-Brun, C., Precis de la Geographie Universelle ou Description de Toutes Les Parties Du Monde sur un Plan Nouveau D'Apres Les Grands Dividisons Naturelles du Globe, 1843. Very good condition. Wide margins. Blank on verso.